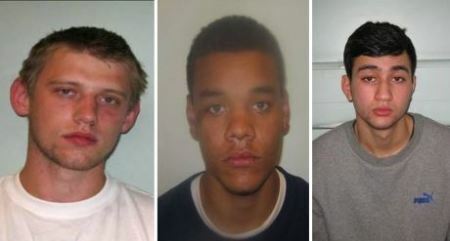 THREE men have been jailed for a total of five and-a-half years after they admitted involvement in the theft of hundreds of bikes from railway stations and other public places across London and Hertfordshire. Officers from the Metropolitan Police Service (MPS) are security marking and registering bikes on BikeRegister today as part of a major drive to enhance relationships with local communities. BikeRegister, the UK’s national cycle database, is partnering with Cyclescheme, the leading provider of tax-free bikes for Cycle to Work schemes, in a unique initiative that will promote and facilitate the registration of bikes supplied via the scheme to the national register used by all UK Police Forces. Officers from Southwark Counter Terrorism Patrol Unit (CTPU) recently held a bike theft and safety awareness day in partnership with the British Red Cross and local council wardens. 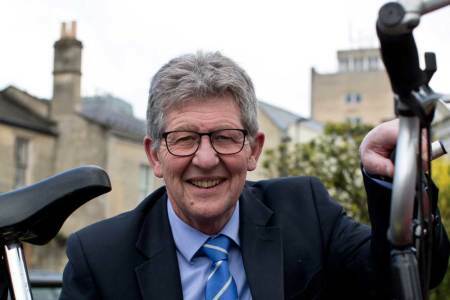 Following on from his hard work to promote safer transport and cycling in Bath, Don Foster MP has had his own bike marked and registered on the UK’s National Cycle Database. 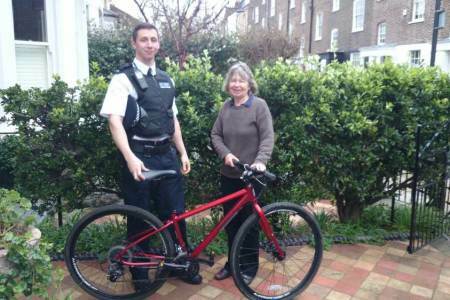 A London woman has been reunited with her stolen bike after police stopped a man for riding it on the pavement 13 miles away, with a check on the frame number revealing that it had been recorded as stolen on the BikeRegister database. 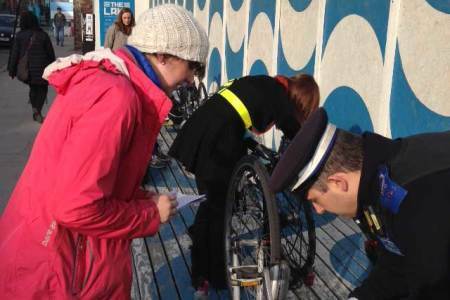 A new bike marking identification scheme to tackle bike theft in Bournemouth is being rolled out across the town. 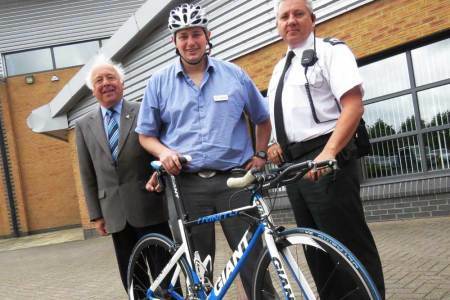 A Police-led initiative aimed at reducing bicycle theft across County Durham & Darlington has been launched. The security of bikes at two universities has been significantly increased following a joint initiative between Devon and Cornwall Police and university service provider FX Plus. Officers from MPS Southwark Counter Terrorism Patrol Unit (CTPU) have marked bikes worth thousands of pounds over the last few months. 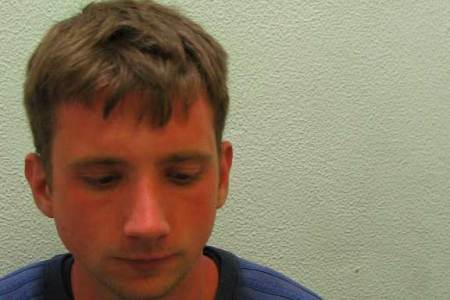 Following checks carried out on BikeRegister as part of London bike theft initiative Project Cycle Ops, a cycle thief has been jailed for 12 weeks and a second man has been fined for handling stolen goods. A joint initiative between North Wales Police and the security department of a local hospital has helped cyclists feel more secure while leaving their bikes on site during the day. A bike that had been marked at a rail station in West Sussex and was subsequently stolen, was recovered and reunited with its owner in less than three hours thanks to BikeRegister. 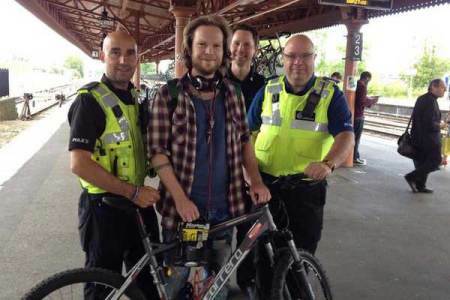 Cycle commuters at Leamington train station were recently able to take advantage of a free bike check and the chance to register their bike on BikeRegister, the leading bike marking initiative in the UK. With a search for a stolen bicycle taking place every 2.4 minutes on the BikeRegister site, the UK’s largest cycle database has revamped its website to simplify its registration process and further aid the recovery of lost and stolen bikes. Nearly 50 bikes along with bike parts and accessories are being donated to a London bike charity in a new scheme launched today by British Transport Police (BTP) in association with BikeRegister. London’s new Cycling Commissioner Andrew Gilligan has met with members of the BikeRegister team to discuss the importance of bike marking as an effective means to deter cycle theft. A scheme to reduce bike theft and identify owners of lost or stolen bikes has been launched across North and West Belfast. New Year, New Bike….Make Sure You Get It Marked! 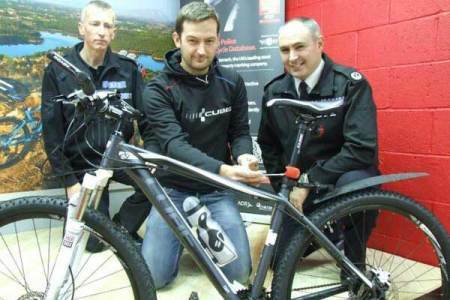 Residents of North Yorkshire who received a new bike over Christmas and the New Year period are being urged to have it security marked at special bike surgeries offered by local police. A new initiative is being launched in West Sussex in an attempt to reduce the number of bicycle stolen from across the county. A Police operation in Norwich involving bike marking has reduced the number of bicycles being stolen in the city by 80 per cent in just two weeks. As the festive season gets under way, the Metropolitan Police Service (MPS) Safer Transport Command and Transport for London (TfL) are reminding cyclists to lock their bikes securely and follow ‘the three R’s’ - Record, Register and Report. A new bike marking scheme set up in Bury, Greater Manchester, hopes to slow down the growing number of thefts in the area. Police in Norwich are launching a new BikeRegister bike marking initiative today in a bid to combat thefts. Cyclists in Hereford are being urged to take advantage of a new police scheme to beat bike theft by getting their bikes marked. Officers from Brent’s Safer Transport Team (STT) have launched a scheme to identify unwanted bicycles handed into the police that could be donated to local primary schools and children they nominate. More than 70 arrests were made last week as a result of increased activity as part of Project Cycle Ops - a partnership initiative between Transport for London the police and cycling groups to tackle cycle theft from public places across the Capital. A crackdown on bike crime has seen police in Peterborough patrolling hotspots to check for thieves and officers marking bikes with BikeRegister after a 50 per cent rise in thefts in the city centre. 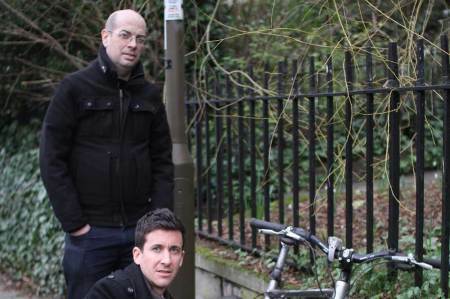 Officers from Hounslow Safer Transport Team (STT) have been working hard to deter bike thieves on their patch and have successfully reduced bike theft in Chiswick (a particular hotspot area) by 44%. 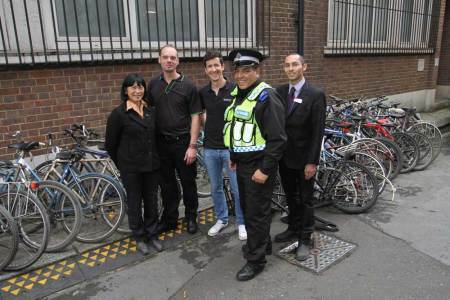 Officers from Hackney’s Safer Transport Team (STT) reduced bike theft in the area by 45% after a concerted drive to lower the crime in the first week of October 2012. Cyclists are being urged to take adequate steps to check the legitimacy of a bike they are buying in order to dramatically reduce the market for stolen bikes. 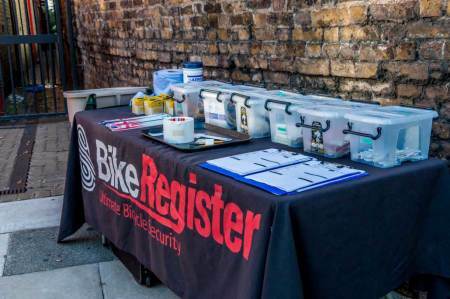 Officers from MPS Hackney recently gave residents and visitors to the East London Borough the opportunity to have their bikes security marked using BikeRegister. 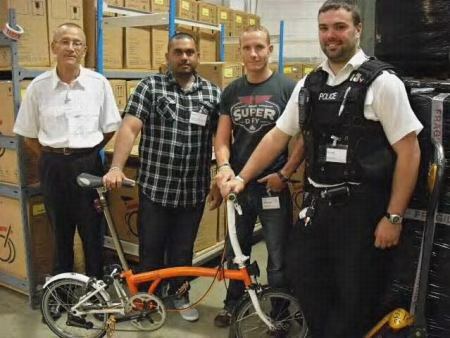 A RARE orange Brompton cycle which had been stolen from the Brompton Bicycle Factory in Brentford, Middlesex was recently recovered from the home of a known bike thief. More than 100 cyclists in the London Borough of Sutton have had their bicycles security marked and registered on BikeRegister during a two-week initiative run by Sutton’s Safer Transport Team. Officers from Kew Safer Neighbourhood Team (SNT) recently found a stolen bike at a local retail park and were able to successfully reunite it with its owner using BikeRegister. A Police initiative to tackle overcrowding on a school bus route by getting pupils to cycle instead has scooped a top prize. 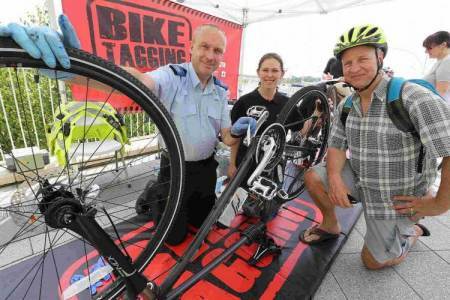 Cyclists across London have even more opportunity to get their bikes security marked and registered as officers from the Transport for London (TfL) - funded Metropolitan Police Service (MPS) Safer Transport Command (STC) increase their bike marking events this month. The owner of a stolen Brompton bike, which was security marked and registered on Bikeregister.com by the Cycle Task Force, has been reunited with it this week. 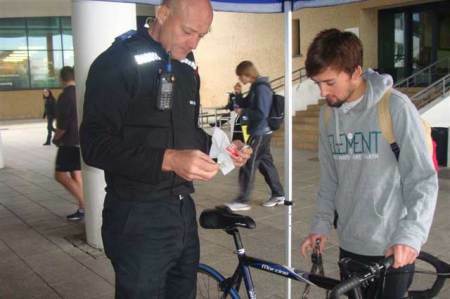 Officers from Northampton North Safer Community Team recently carried out bike security marking using BikeRegister at Northampton College. 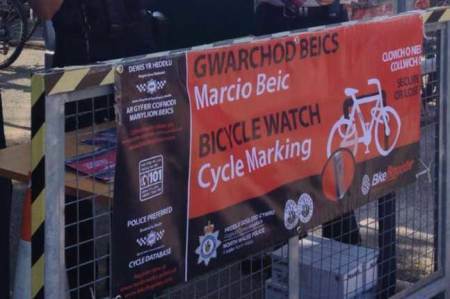 A major Bike Watch scheme is clamping down on bike theft when it launches today across the whole of North Wales. 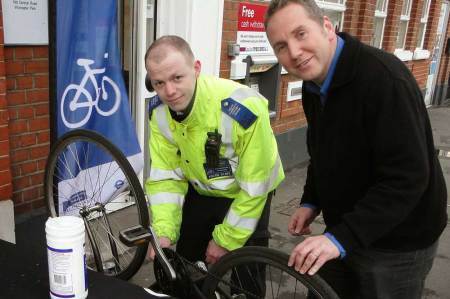 Cheshire police have left their mark at a successful event in Holmes Chapel village centre. Two Brompton owners who had their bikes stolen have been reunited with them, following an investigation by the Metropolitan Police Service Safer Transport Command’s Cycle Task Force, funded by Transport for London. 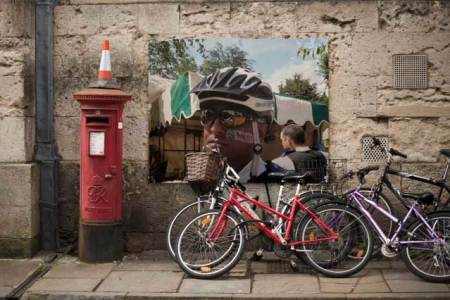 With cycle-to-work schemes becoming ever more popular and with warmer weather tempting out more fair-weather cyclists, police in Taunton are reminding people to remember to lock their bikes up, not only when out and about, but when they are stored at home. Cyclists in Stockport were urged to saddle up and beat the bike thieves by taking advantage of a new bike security scheme using BikeRegister. Police in west Cumbria are recommending the use of BikeRegister after bike theft increased significantly in the area. Officers in Wales have marked and registered new police bikes with BikeRegister to protect them from being stolen while they are on duty. Cyclists in Widnes have been offered the chance to have their bikes security marked and the details logged on the BikeRegister database. Officers from Northamptonshire Police recently set up a bike surgery and crime prevention initiative at a local specialist sports college. 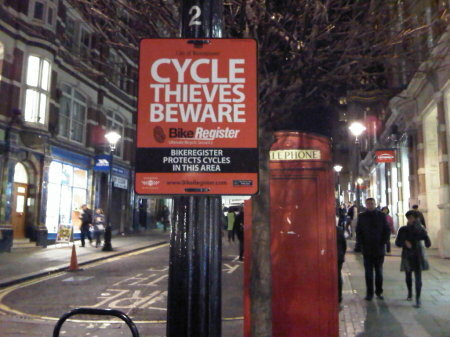 Over 750 bikes were security marked and registered on BikeRegister by officers from the Transport for London (TfL) funded Metropolitan Police Service Safer Transport Command (STC) last month, in the lead up to Christmas. The City of London has seen a spate of cycle thefts in recent weeks and, in a bid to reduce bicycle thefts and help owners to protect their bikes, the City of London Police will be holding a free bicycle marking event using BikeRegister on Wednesday, 18 January at Finsbury Avenue, Broadgate Estate. © Selectamark Security Systems plc 2004 - 2019. All rights reserved.